We are on the last page of the four page itinerary that we received from Aurora Maris Travel at the beginning of our trip. Anita and Srdan are the behind-the-scenes representatives that ensure our bus, hotel and meals are arranged. Felipe is our representative of Dnipro Gold and Sergio's right-hand man who was sent from Brazil to ensure that we had someone with us at all times and to assist with decision making each day. Our guide Damjan, who has been with us since we left Dakovo, is not with us today so that he can tour the wives of the representatives from around the world at a conference here. Imagine our surprise when we heard that our Damjan was taking Christine Zwozdesky for a tour today because she is here with her husband--the Hon. Gene Zwozdesky. So terrific of both of them to take time out of their busy schedules to visit with the group as we were sitting down to dinner last night. And how proud we were to be able to introduce them as our friends. But I'm getting ahead of myself. A lot has happened since we left Vienna! When we left Vienna on the 13th we stopped at a lovely roadside restaurant and had a wonderful lunch so that we could spend more time in the beautiful city of Graz. By late afternoon we were in Zagreb and had a brief tour to orient ourselves with the landmarks. July 14th was a Zagreb day of site seeing, including a spectacular cemetery--yes, a cemetery. The grounds and memorials were beyond extravagant and our guide said that the cost of some could buy a condo. We are all glad to have visited there. In the afternoon the group went to the mall and the boys bought retro shorts which they wore the next day. Check out the legs in the shot with the statue in Ljubljana! Yesterday we travelled to Ljubljana and on the way stopped for lunch at another wonderful restaurant. Ljubljana is a beautiful city with many shops, a canal, cafés and churches--that don't allow short shorts and spaghetti straps... for the girls either ;-) It was also Lauren Dzenick's birthday and in celebration of her day, her mom arranged for two cakes which we enjoyed with dinner. Today is MaryAnn's wedding anniversary and the non-dancers will toast her (minus Bill) tonight. 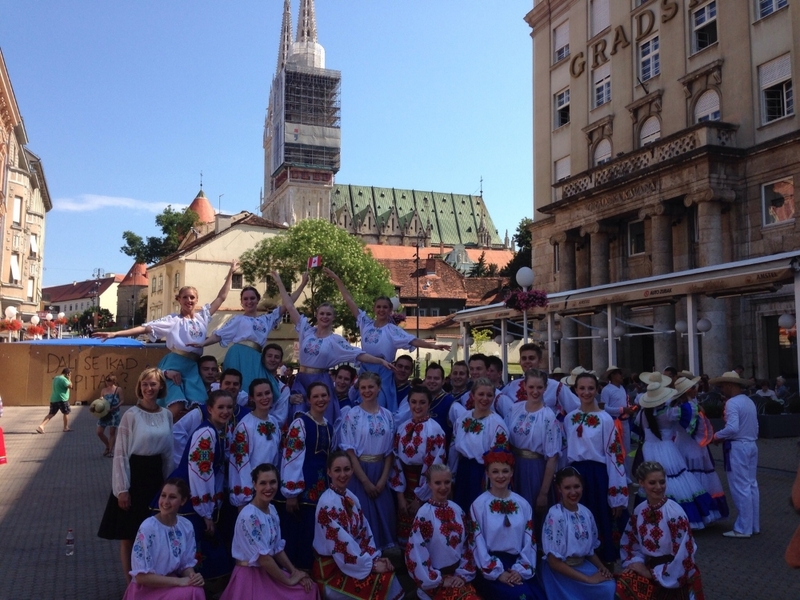 This morning the dancers headed to the square where they performed at 10:30 am. They gathered quite the enthusiastic crowd (as the festival organizers hoped they would) and despite initially having planned only having a short performance for tomorrow, the organizers have extended the time to also include Hopak! Tomorrow night we will say farewell to this warm and inviting city and to our many new friends. Some members of the group will travel to other parts of Europe while most of us will fly home where you can hear the many stories that were not posted. Ask Tatiana about the lock on her hotel bathroom door. Or ask the Dzenicks about their detour to St. Steven's Church in Vienna. I hope to post some dance shots soon! 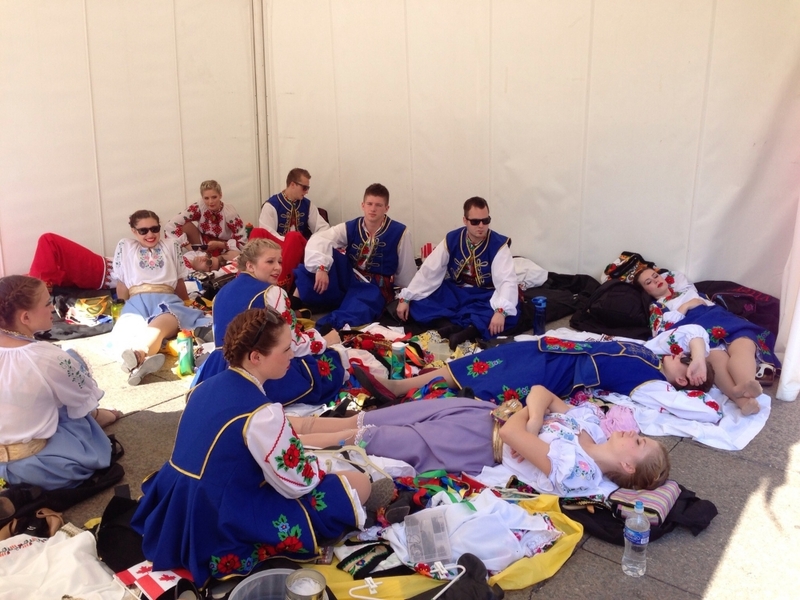 Prior to wowing the crowd here this morning in Zagreb, the dancers rest in the tent out of the sun. Viter in Zagreb this morning. After spending the morning at the spectacular Schoenbrunn Palace (http://www.schoenbrunn.at/en.html) we had a traditional schnitzel lunch and then we prepared for the show. We all dressed in our costumes and embroidered blouses and were greeted by the parish priest of St. Barbara Ukrainian Catholic Parish, who thanked us for joining their parishioners for mass and for upholding our Ukrainian culture in Canada. We then joined Troyanda in a hall, filled with Ukrainian citizens of Vienna, to put on a concert of dance emceed by Susan Romaniuk of Viter and Vincent Rees of Troyanda. What an appreciative audience! After a standing ovation and chanting of "Molodtsi!" the crowd gathered to take photos with the groups. It was a relatively early night as the Zabava was cancelled out of respect for the loss of lives in Ukraine earlier in the day. And we all needed to pack for our journey today to Zagreb via Graz. Tomorrow we have a city tour and an opportunity to do a little shopping. Between the heat and occasional rain showers, the weather has kept us guessing as to what to wear but the group has rolled with the changes and has remained positive and prepared to do whatever becomes the plan. Tasha has encouraged the group to change up the seating arrangement for meals so that we are all getting to know different people in the group. It's been a great opportunity to know about the variety of people who make up this terrific group of Viter Dancers! Yesterday we left the lovely city of Budapest and made our way to Vienna via Bratislava, Slovakia. The historic city hosted us for several hours as we shopped, ate traditional cuisine and saw the sites which included a huge castle on a steep hill. When we arrived in Vienna we checked into the hotel and met Susan R. who had flown in from New York after her tour with Dnipro Choir. We viewed the city from the bus while Damjan, our knowledgeable guide provided historical and practical facts about the capital of Austria. What a cosmoplitan city! Our evening ended with a delicious dinner overlooking the park around the corner from theatre where some attended the symphony tonight. Today we walked throughout the city centre and saw the Opera House, Belvedere Palace, St. Steven's Cathedral, St. Charles' Church, Sissy Museum and Hofburg Palace. We stood outside Mozart's home while our guide provided us with numerous facts about her city. Although we dealt with rain off and on throughout the day, tonight several people saw a concert at the Opera House while others went to the symphony and the rest went to Prater which is an amusement park. Ask the 20 people about their adventures on the many roller coasters and rides that were experienced! Tomorrow we meet the Ukrainian community and perform again. We are looking forward to showcasing our talent along with the Troyanda Dancers of Winnipeg and joining them for the Zabava after the performance. We have been very busy with our travels. We arrived in Budapest on July 7 in the evening after visiting the city of Pecs where we saw a beautiful cathedral and exquisite architecture. By 8:00 we arrived in Budapest and went to the vista of the city to see the entire lay of the land. We then had a wonderful Italian dinner as a group and went back to the hotel for a good sleep. July 8th saw the group touring the city and saw the parliament buildings, a beautiful cathedral (St. Stephen's Basilica) and the Milenium Square (Hero Square). The group spent the afternoon shopping or at the thermal pools and then met up with the Troyanda Dancers at the Csarna Restaurant for a traditional Hungarian dinner and entertainment. Troyanda performed and the Hungarian musicians and dancers enhanced an already entertaining evening. Whether winding through the crowds in a folk dance style or dazzling everyone with a gypsy routine, Viter entertained. The girls demonstrated their ability to balance a carafe of wine on their heads and Nick H and Mitchell showed their ability to stay balanced even while blindfolded. Today we were back on the bus and visited Eger and Godollo. Both cities had beautiful castles and palaces with the latter featuring a gorgeous garden. We have had a little rain over the past two days but it hasn't dampened our spirits. All is well as a number of us board a river cruise tonight. Tomorrow we are off to Vienna! After touring the city and catching the sites of the town, the group blew away the audience with a spectacular performance! We watched the Troyanda Dancers from Winnipeg as they performed in an unexpected downpour of rain. After meeting several of the performers we headed back to our hotel for a very early morning where we showed off our new banner and danced to an enthusiastic crowd who lined the streets of the parade route. After the parade we headed back to the stage for another crowd who cheered wildly to our Hopak! Trevor and Laura represented Viter in the Beautuful Costume Pageant and qualified for the finals. Tonight we will watch them as they strut their stuff and explain their Hutzul and Transcarpathian costumes. We will let you know how they do. Everyone is healthy and having a great time. Tomorrow we are off to Budapest and look forward to more adventures in a new country! Ready for the parade. Savannah McLean and Lauren Dzenick carried our banner and Tasha donned a Buko costume and joined the dancers. We have arrived....with all of our luggage! A quick update today to let everyone know that after a long day of travel, our group of 39 has arrived safely with ALL 67 pieces of luggage accompanying us! (A great success indeed!) We are now on our way by bus to our first destination - Dakovo, Croatia, where we will be participating in an international folklore festival. Stay tuned for more updates and photos soon! Waiting in Vienna for the plane to Zagreb. 03 July - The group leaves at 7:00 and 8:00 a.m. and meet in Zagreb. We are excited to announce that our Viter Ukrainian Dancers will be touring Europe from July 3-18, 2014. We look forward to performing at international folklore festivals and experiencing the countries of Croatia, Hungary, Austria, Slovakia and Slovenia. Be sure to periodically check back for tour updates here on this blog. We look forward to sharing news of our travels and adventures with you along the way!